Non-enveloped, filamentous particle about 1500-1700 nm in length. The virion body is assembled by the major capsid protein (CP) and the tail by the minor capsid protein (CPm). Linear ssRNA(+) genome of about 16-17 kb. The 3' terminus has no poly(A) tract and the 5' terminus probably has a methylated nucleotide cap. Encodes 10 proteins. TROPISM GLRaV-7:phloem; affects the cytology of differentiating sieve tubes, parenchyma and companion cells. GEOGRAPHY GLRaV-7: Europa, Egypt, Palestine, Turkey, North America, Chile and China. 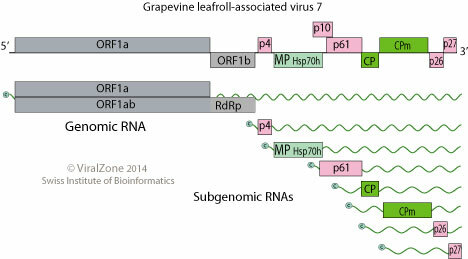 ASSOCIATED DISEASES GLRaV-7: Symptomless in white-berried grapevine cultivar from Albania. However, it induces leafroll symptoms onto grafted cv. Cabernet.